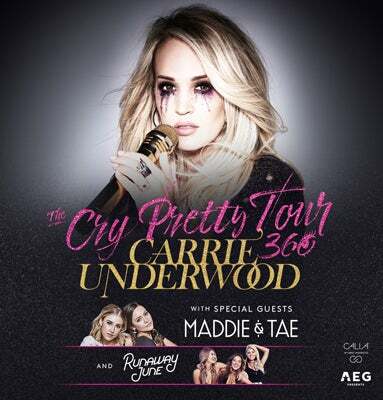 For more information including the Cry Pretty album/ticket bundle, go to http://www.carrieunderwoodofficial.com. Also beginning Monday, August 13th, a limited number of exclusive VIP Packages will be available which include an amazing selection of tickets, Meet & Greets, autographed memorabilia, custom merchandise and much more. About MADDIE & TAE: Award-winning duo Maddie & Tae recently released their brand new single, “Friends Don’t,” "anchored around their stellar vocal pairings and some of the tightest harmonies on Music Row (Rolling Stone). Co-written by the pair, “Friends Don’t” is the lead track from their forthcoming sophomore album, which will be released on Mercury Nashville. Maddie & Tae first broke out in 2013 with their brilliant take down of bro-country, “Girl In A Country Song,” which took Country radio by storm, skyrocketing to the top of the charts and quickly going PLATINUM. The Platinum-selling duo became only the third female duo in 70 years to top the country airplay charts, also earning trophies from the Country Music Academy and Radio Disney Music Awards along with multiple ACM, CMA and CMT Award nominations. Receiving widespread praise from NPR, Billboard, Entertainment Weekly, The Washington Post, Glamour and others, country music’s hottest stars including Dierks Bentley, Lee Brice and Brad Paisley have welcomed Maddie & Tae on the road. About RUNAWAY JUNE: Lauded by Billboard as the “Next Hot Trend in Country Music” and likened to a ‘Dixie Chicks for a new generation,’ Runaway June’s organic three-part harmonies and ringing strings are sweeping the nation, leaving a mark on one infatuated audience after another with its “inescapable talent” (AXS.com). The BBR Music Group/Wheelhouse Records act is comprised of the vocal stylings and musicianship of Naomi Cooke (lead vocals, guitar); Hannah Mulholland (vocals; mandolin); and Jennifer Wayne (vocals; guitar). The trio is receiving rave critical notices from the likes of Billboard, Rolling Stone Country, The Huffington Post, CMT and more for its brand of organic and melodic Country music. Runaway June is the first all-female trio in over a DECADE to earn two Top 40 hits and recently scored a 2018 ACM nomination for New Vocal Duo or Group of The Year. They are finalizing their debut project for Wheelhouse Records, due out later this year.